More from David Keaweamahi on Japanese contract laborers, 1890. INFORMATION FOR THE HAWAIIAN PEOPLE! Please allow me to introduce you to the new things I have seen in my newspaper which I believe are new information important to spread; which I invite you to kindly insert into your newspaper, Ko Hawaii Pae Aina, for the benefit of the readers and the nation. I was pleased to see the thoughts of a famous newspaper of Japan, praising Hawaii as the place where a great number of Japanese laborers obtained a big sum of money, more than they’d receive in their homeland. This newspaper likened Hawaii to a school of education, where a child receives the wealth of knowledge, equal to the amount of lessons he studies; so too with the Japanese who are going to Hawaii, where they get high salaries that they’d not get here, and for more intense work than in Hawaii, along with more hours. This paper also stated that within the past five years, the total number of Japanese laborers including men and women has reached 14,000, sent by the Board for Emigration of Japanese Laborers. And within this period, these laborers, as a result of their effort and their saving of what they earned, made a great amount in Japanese money, not less than 2,000,000 yen; and not included with this, they paid the ship owners half a million yen to take them from Japan to Hawaii and return. Their departure from the land of their birth—Their travelling across the great ocean at great expense—The landing as strangers in Hawaii—Working all sorts of jobs for a boss who is a stranger—Enduring the work—Eating only a little without wasting—Caring for what they have—The results of their putting up with the work, that being millions of dollars. I believe that this is ample explanation, O Friends of the same womb, for you to think about; for the work has come to your door O Hawaiians—diamonds, gold, and money, right before your eyes; it is not far away like for the Japanese for whom it is far, far away. Look at the hardships and the facing of the spray of the Pacific Ocean whose distance from Hawaii to Japan is 3,440 miles; this distance and hardships became nothing to them. And O Mr. Editor, I am sending a copy of the newspaper, “The Tokyo Mail” of August 7th, 1890, and within it you will see all of what this paper has said, and it is for you to patiently translate it all. As I am preparing to send to you the news above, I have also received from my true friend, J. W. Girvin, Esq., our Hawaiian Consul in the city of San Diego, California, the newspaper “The San Diego Union”. Within this paper, he explained fully the value of coconuts, starting from the trunk to the leaves; we are familiar with coconuts and its value; and with our consul explaining the value of the coconut, I am thinking that there are also other sources of wealth for you, O Hawaiians, like sugarcane, rice, bananas, and so forth. He explains that coconuts can be found in Hawaii and the islands of the Pacific Ocean. Therefore, I am sending this paper with hopes that you will translate it for the good of our people, being that it should not be long before Hawaii starts receiving inquiries for coconuts because of this important description of Hawaii’s good friend dealing with the asset not put to use by Hawaiians in the past years. It is a very admirable thing that the government selects good people with good ideas to search after the well being of the people that conferred upon him that honorable title, Consul, like J. W. Girvin. When I look at the ideas of this servant of the nation, I know that he is searching while pulling along the minds of entrepreneurs to look to Hawaii to export coconuts, like the other produce exported from Hawaii to other lands. And should this description of our Consul become something that the wealthy people and trade companies of foreign lands latch on to, then those great fields of coconut from Hopoe until Kahaualea in Puna, Hawaii will become a source of wealth; so too the stands of coconut in the Kona districts, along with those of Maui, Molokai, Oahu and Kauai. And even more so, with the opening these days of new steamship lines which go directly from San Diego to Hawaii. This clarification should be sufficient. No. 9 Fujimi Sho [Fujimi-cho], Kojimachi, Tokyo, Japan, Sept. 13, 1890. Ko Hawaii Pae Aina, Buke XIII, Helu 39, Aoao 2. Sepatemaba 27, 1890. 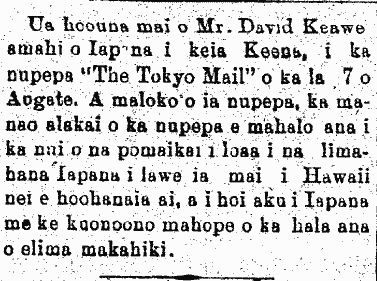 David Keaweamahi living in Japan, 1890. Mr. David Keaweamahi of Japan sent the newspaper, “The Tokyo Mail” of the 7th of August. Within that paper, an editorial expressed appreciation at the great benefits gained by the Japanese laborers brought to Hawaii nei to be put to work and then returned well off to Japan after five years. Two interesting testimonials appearing in the same issue, 1892. 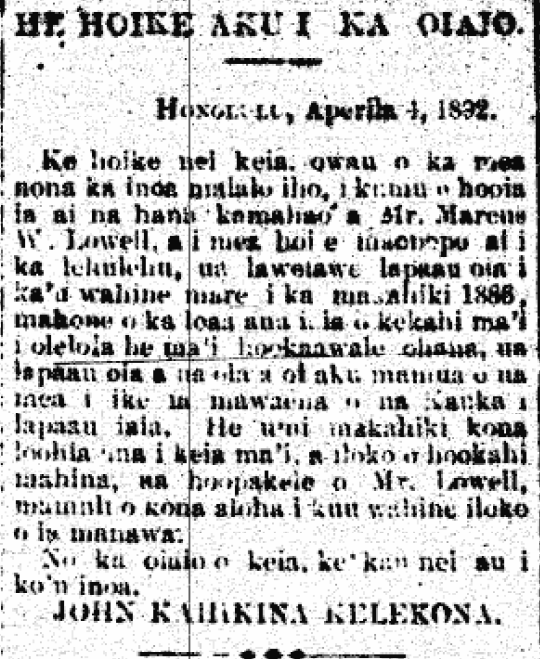 I hereby attest, I am the one whose name appears below; in order to verify the miraculous works of Mr. Marcus W. Lowell, and so that the public knows, he treated my wife in 1886 after she contracted the disease known as the sickness that separates families [ma’i hookaawale ohana]; he treated her and she got much better than with the doctors who treated her. She suffered for ten years from this sickness, and within a month, Mr. Lowell saved her because of his aloha he had for my wife during that time. To attest to this, I place my name here. Ka Leo o ka Lahui, Buke II, Helu 428, Aoao 2. Aperila 8, 1892. I, George Campton, carpenter, have been a resident of these Islands for the last 14 years. 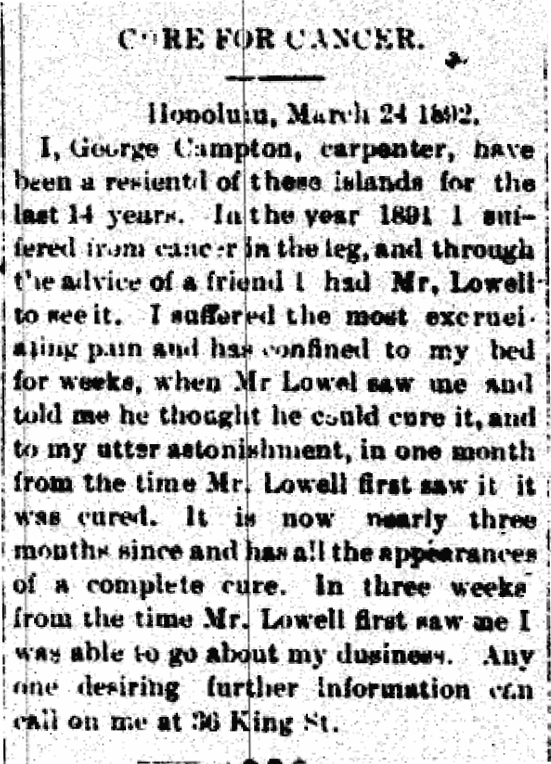 In the last year 1891 I suffered from cancer in the leg, and through the advice of a friend I had Mr. Lowell to see it. I suffered the most excruciating pain and has confined to my bed for weeks, when Mr. Lowel saw me and told me he thought he could cure it, and to my utter astonishment, in one month from the time Mr. Lowell first saw it it was cured. It is now nearly three months since and has all the appearance of a complete cure. In three weeks from the time Mr. Lowell first saw me I was able to go about my dusiness. Any one desiring further information can call on me at 36 King St.
Ka Leo o ka Lahui, Buke II, Helu 428, Aoao 4. Aperila 8, 1892.